Welcome to your first Rockport fishing report for the month of April. March ended on a little bit of a high note… for the most part. Hopefully April will finally warm up a bit more for us and kick the Spring fishing into high gear. But for now, this Rockport fishing report will cover what we’ve seen in the past week and what we expect for the coming days. Since our last report, things had begun to warm up a fair bit. Sunnier skies, warmer temps and reasonable winds had been common place as we were closing out the month of March. With the improvement in weather, we did see some improvements in the fishing as well. We would say it was good, but not great. Still, a step in the right direction towards proper Spring fishing. Last weekend, we had yet another cold front pass through the South Texas Coast. This one was pretty nasty too. Sunday brought high temps around 50 degrees, winds 25-30 from the North and a pretty healthy shot of rain as well. Not exactly what we were hoping for as we have been waiting for our water, and fishing, to warm up. So we scratched all of our trips that day in favor of staying home and watching a little golf and tying flies. As the storm began to pass, we were able to get out on the water again Monday. We chose to fish up in Port O’Connor that day, to hide from some of the North winds. Temps remained in the low 50’s with a few light drizzles and some manageable North winds. Expecting it to be a bit rough going out there, we were actually pleasantly surprised with the number of fish moving around the flats. By the afternoon, if you could still feel your hands, there were a bunch of fish to cast at up shallow. Clearly they wanted to eat, despite the unseasonably cold temps out there. Definitely worth the effort that day. Today was your quintessential “day after the storm” type of day. Clear skies, light winds and considerable warming trend throughout the day. And as one might expect, the fish were on the warpath. Even with temps in the lower 50’s as we made it to the flats, the fish were already tailing, crashing banks and cruising around in very good numbers. As the day warmed up, and the tides flipped, it just kept getting better and better. All of the boats we had out today reported seeing tons of fish and landing many. This was easily one of the better Spring fishing days we’ve had on the Texas flats this year. And much needed, before we all started to lose our minds! Pretty typical fly selection lately. Capt. Jeff loves to start with his black crab. Capt. Gibson likes his version of a kwan. And so on, and so on. Not much action on the topwater in the last week. Probably should’ve tried it today, but didn’t even bother, with as many fish as we were getting to the boats. But if the fish activity continues, that will be another go to here sooner than later. There has been a couple of shark and jack sightings here lately. So the 10wt is in the boat and ready to roll every day now. We’ve made a couple of attempts out to the open water early in the mornings, but have yet to see any activity of note. The water is still a bit chilly, but it’s good to know those guys are starting to show up out there. Other than that, the water levels and tides have been pretty favorable. Even with the stout North winds, the water remained at a good level. Plenty enough to get around and fish most anywhere you may want. The daily tides have been pretty solid as well. Plenty of moving water throughout the days, to keep those fish happy enough and active. So all that is in place. Just need that sun to continue to warm those water temps up a little bit more. The weather for the remainder of this week isn’t too bad. A bit cloudier than we would like most days, but the winds are fairly light and easy. Also, the temps are hovering in the upper 70’s most days, which will help keep things warm and hopefully get those fish moving around each day. Perhaps with all the extra overcast junk, we’ll start seeing more of the tailing schools that we have been lacking thus far. Fingers crossed for that. But all in all, it is looking pretty solid through the weekend for us. Our recommendation… It’s looking like we are finally getting our Spring fishing down here on the Texas flats. So now is a pretty good time to make it happen down this way, if you can. So long as we keep things warm, the fishing will just keep getting better and better around here. We have a bunch of boats out each week right now, and will continue to keep the updates coming. Hopefully the next will come at the end of this weekend. 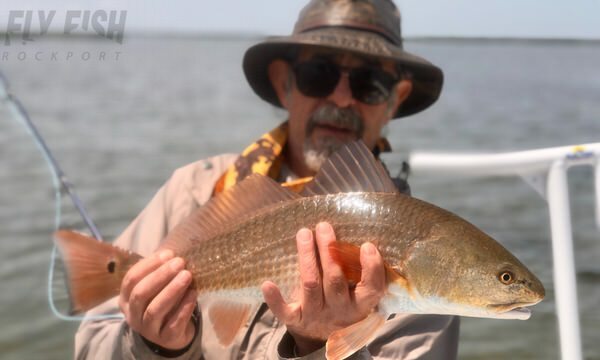 If you are looking to get out on the water, you can always contact us any time if you would like to BOOK A TRIP or need any up to the minute Southwest Texas fly fishing or Rockport fishing type news. We continue to post on Instagram, Facebook, Twitter and Snapchat. Or perhaps SUBSCRIBE to our YouTube Channel as well. We continually are trying to add more videos and stuff there. We try to keep stuff fresh for those of you that are wishing you were on the flats with us. So be sure to follow us on all our social media stuff. And don’t forget to sign up for our monthly newsletter below.